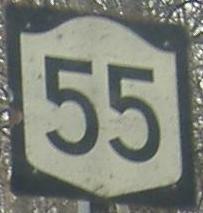 New York is making the most of its gift from Pennsylvania, westbound at the end of NY 55. 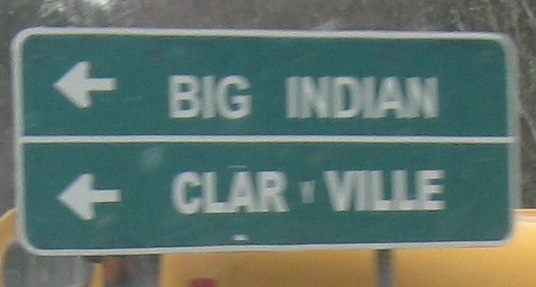 Two of many state-initial shields, eastbound. 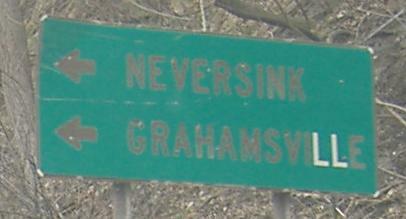 These were put up by Putnam County sometime in the 1970's, maybe into the early 1980's. 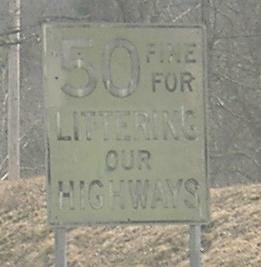 The reason 55 is co-signed with all these county routes is because it's not state-maintained within Putnam. 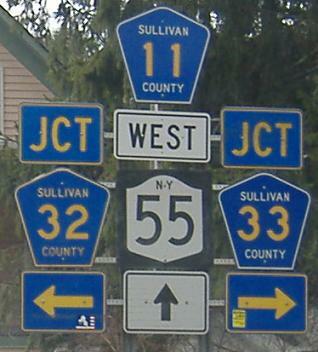 As you see, Putnam's system of numbering has each route link two towns or other important junctions, and then give way to the next-highest numbered route. 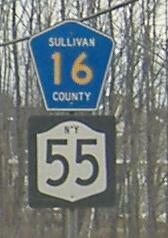 Numbers progress northward and eastward; although NY 55 is an east-west road in New York, it's north-south in Putnam County, as are CR 11-16. All eastbound. 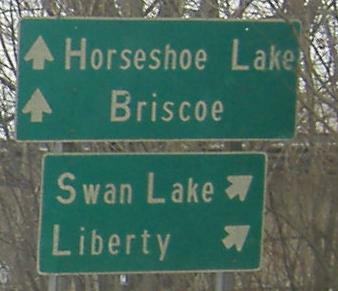 The first two signs were erected by the state; the new one is wrong (the B should be half-size) and the second one, you tell me why I took its photo. 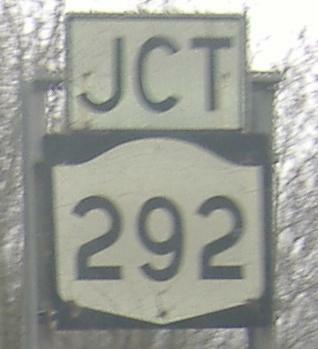 The last two signs were erected by the county, and thus the LGS font looks strange and the state-initial shield reappears. 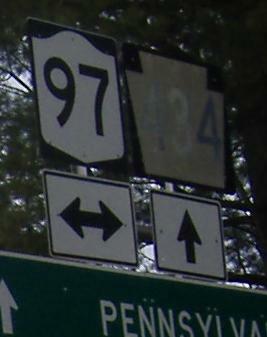 The LGS points toward CR 141, which is so numbered because it branches from CR 14. 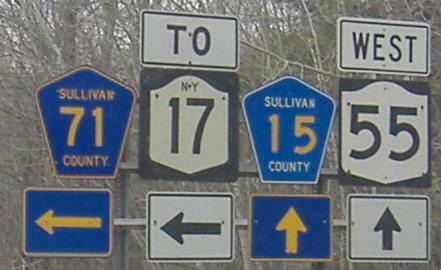 It's terribly confusing for motorists to follow county highways through Putnam, but very easy for the county to keep track of them. 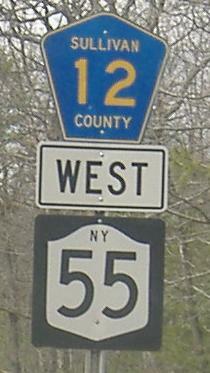 Throwing in a pair of westbound photos leaving NY 52. 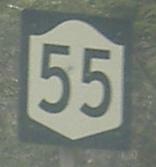 Back eastbound again, still with NY 52 and former NY 17 in Liberty. NY 55 leaves at the second photo. Again, all eastbound. 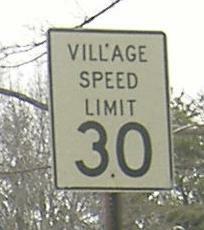 The third photo, with just a few select letters faded, is at CR 105 (which is not a branch from CR 5, but based on 101-102-etc.). 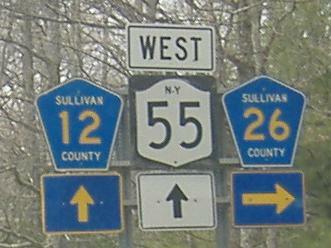 The next two photos approach Sullivan CR 19, Claryville (pardon the "y") Rd., and the former routing of NY 42 through Catskill Park. 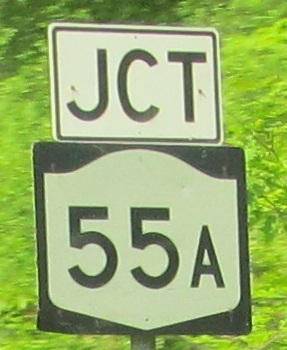 Eastbound from one end of NY 55A to the other. 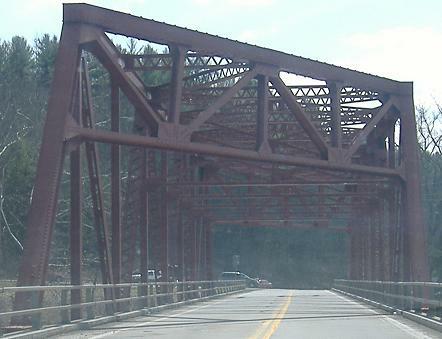 There's not much to say - just these things are all old, and perhaps the truss is oldest of all. 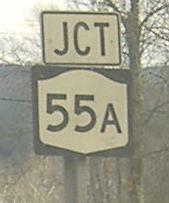 The 55 in the last photo looks like it may have started out with a NY above it that has since faded away. 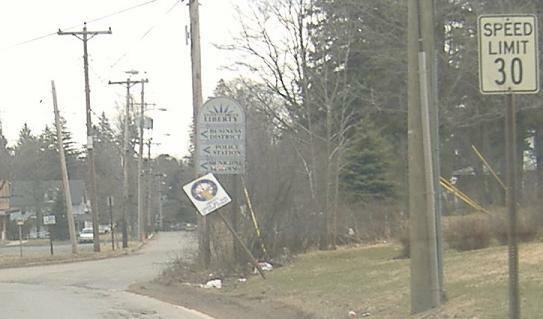 WB at and just past the eastern end of 55A, across Rondout Creek. 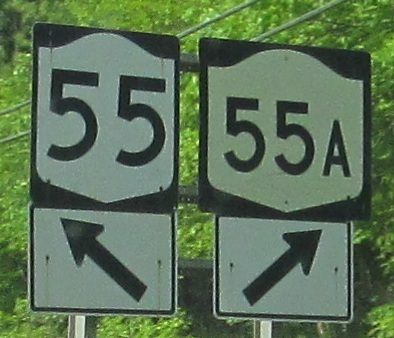 Now you can easily compare 5's between the old NY font and the FHWA standard. 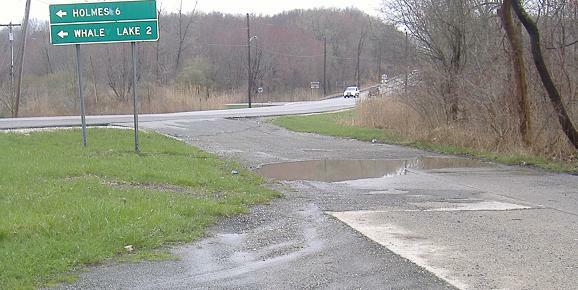 Just off NY 55, these photos look north across a bridge on Bennett Rd., also across Rondout Creek, from Sportsman Rd. While I was poking around Bennett Rd., I saw these. I have no idea what they are, but they're awfully plump and succulent. 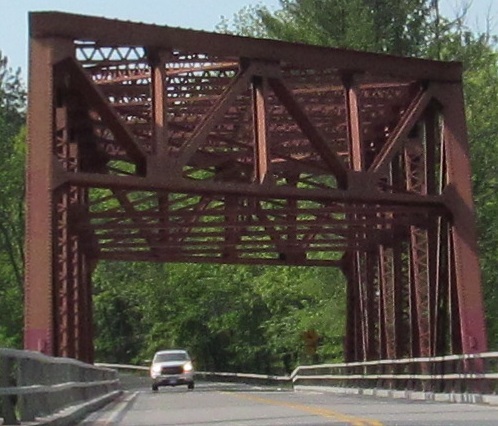 A similar bridge, EB across Rondout Creek (of course) near Napanoch. 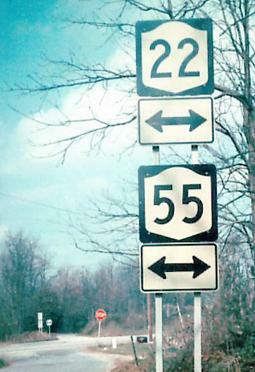 All of a sudden, on the other side of the river and of the long NY 55/US 44 duplex (see the links at the bottom of the page). 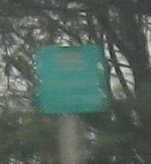 The photo may be blurry, but it contains Taconic State Parkway shields with lower-case lettering. They look ugly. 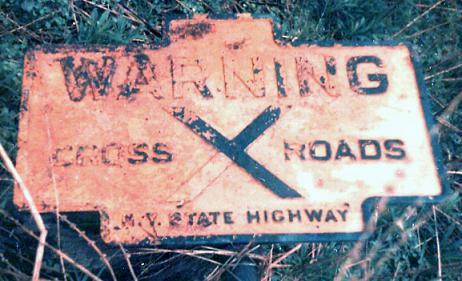 Signs in that area looked a lot better in 1977. Courtesy Michael Summa. 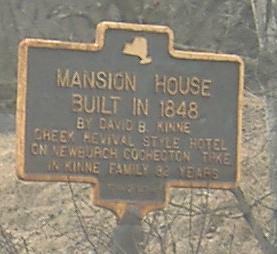 Old sign on old 55, east of NY 216. 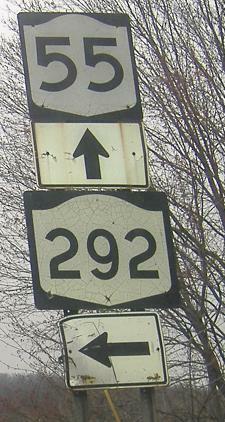 Looking east at an abandoned original concrete section of NY 55, just east of NY 292, and then looking back west from it at the end of 292. 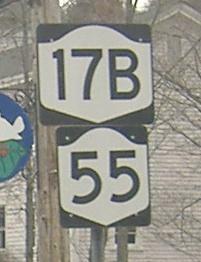 The old road in the previous photo started at NY 216, and then NY 292, which used to end at it when it was NY 55, turns right to get to the current 55. 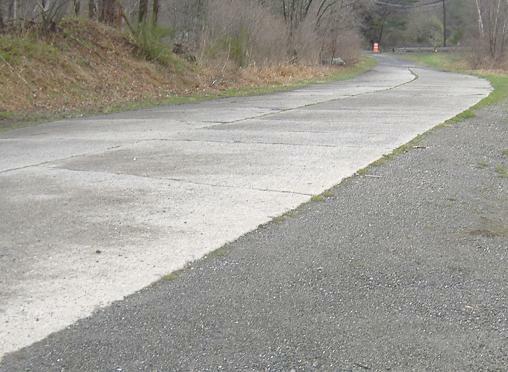 This abandoned segment is where the old road simply kept going straight from there into the next currently open old alignment. 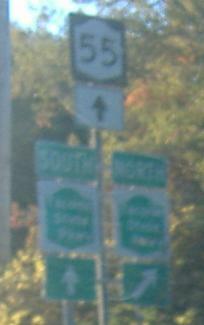 It becomes Main St. in Pawling, which NY 55 now bypasses to the south. 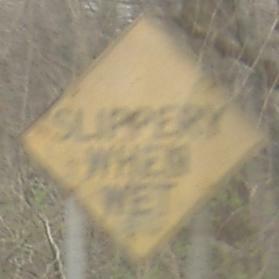 Westbound, same spot. 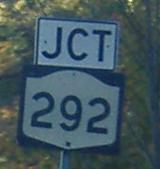 Notice the notched 2's and loopy 9's of the old NYSDOT font. 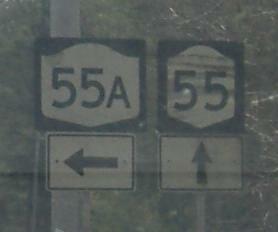 Eastbound, same spot; even the 5's are old. Don't be fooled by that last sign; it has nothing to do with the concrete road from a few photos ago, but rather an even older road that was supplanted by the concrete. 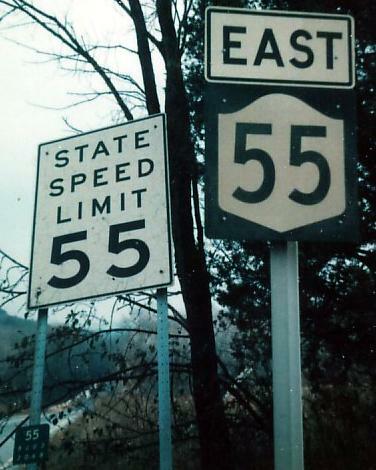 Two more 1977 Michael Summa signs, from old NY 55 outside Pawling. 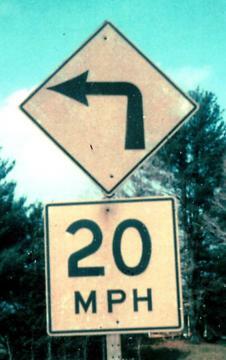 These date to the 1950's or early 1960's, when arrows were tapered and 2's were notched. SB in Pawling in 1977, courtesy Michael Summa. 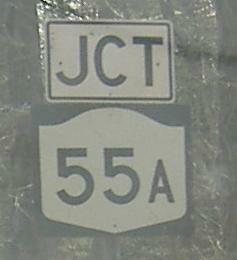 There are several old alignments of NY 22/55 along the multiplex. Pick one, and put these 1977 Michael Summa photos on it facing NB. 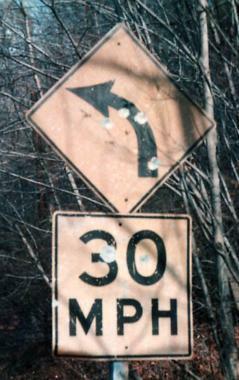 Michael says a friend took the first photo, and therefore he didn't take this sign, but once it falls, it's basically gone. The northern end of the long multiplex as seen from Dutchess CR 21 in Wingdale, again courtesy Michael Summa, again from 1977. 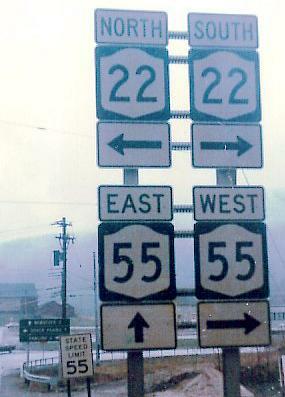 Actually, it just broke up to the south, so straight ahead is still CR 21 until it hits NY 55 in 500 feet. 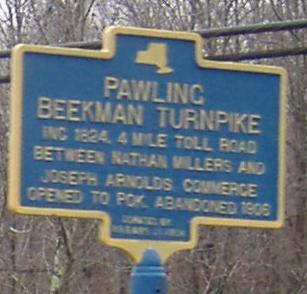 Onto the Taconic State Pkwy.